“The Boy Who Could See Demons” is named Alex Connolly. He’s ten-years-old, and lives in a decrepit council house in Belfast, Northern Ireland. His mother, Cindy, has serious problems. She loves Alex, but she can barely take care of herself. She’s tried to kill herself multiple times, but Alex always seems to be there to save her. On her last attempt, she nearly succeeded. Alex was frozen in the room with her. Only his drama teacher showing up to give Alex a ride to rehearsal saved Cindy’s life. Alex was taken to the hospital himself in a sort of catatonia. Since eight out of ten children of parents who self-harm also self-harm, the doctors called in psychiatric help for Alex. Alex’s demon goes with him to the hospital. The demon’s name is Ruen, and he can pop up anytime. Sometimes he comforts Alex—sort of like an uncle might—and other time he’s more cajoling and demanding. But Ruen is a constant in Alex’s life, and he has very few of those around. The primary psychiatrist is Dr. Anya Molokova, a rising star in the world of pediatric psychiatry, especially renowned for her work in early-onset schizophrenia. Assisting her is Michael Jones, the social worker who’s been assisting Alex’s family for years. Anya has some personal experience with early-onset schizophrenia. Her own young daughter suffered from it, and jumped out a window, killing herself at age 12. Alex and Anya develop a close relationship; a trust forms, and he believes her when she says she wants to help his mother and him stay together. He also opens up to her about Ruen. Ruen encourages this. In fact, the demon actually feeds Alex questions to ask Anya, and once has Alex write out a piece of music to give to Anya. Anya is convinced Alex suffers from early-onset schizophrenia, and he wants to get him into a hospital where he can receive proper care. Michael Jones, the social worker, keeps fighting her on this, knowing that if Alex is committed, he and Cindy would be separated. After a horrifying incident at Alex’s play, there’s no more doubt: Alex needs the hospital. Once he gets there, Ruen seems to ramp-up his mischief, asking more and more of Alex. Things continue to deteriorate between Alex and Anya, until something has to give. 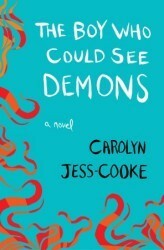 Carolyn Jess-Cooke’s “The Boy Who Could See Demons” is one of the most-suspenseful books I’ve read in a long time. It’s part thriller, part horror novel. The narrative is broken up into Anya’s and Alex’s points-of-view in alternating chapters. In Anya’s, we learn of Alex’s mental deterioration. In Alex’s, we hear what Ruen is saying to him, and what the demon wants the boy to do next. We know there will be a showdown, but when and what it will be elude us. I will say this: the last 15 or so pages of “The Boy Who Could See Demons” absolutely gave me goose-bumps. It’s a powerhouse ending to an already addictive book. Ms Jess-Cooke does an admirable job keeping Anya’s and Alex’s narrative voices different, an essential skill for this type of narrative. She also feeds us bits and pieces of Anya’s backstory to keep us enticed. We know she has a nasty scar on her cheek, but we don’t know how she got it until later in the book. Again, “The Boy Who Could See Demons” will keep you on tenterhooks, slap your emotions around a bit, and ultimately leave you completely drained. It’s that great a book, one hell of a ride, and an absolute must-read for any fan of psychological horror. This entry was posted in Best Books of the Year, Books, Horror, Mysteries/Thrillers. Bookmark the permalink.